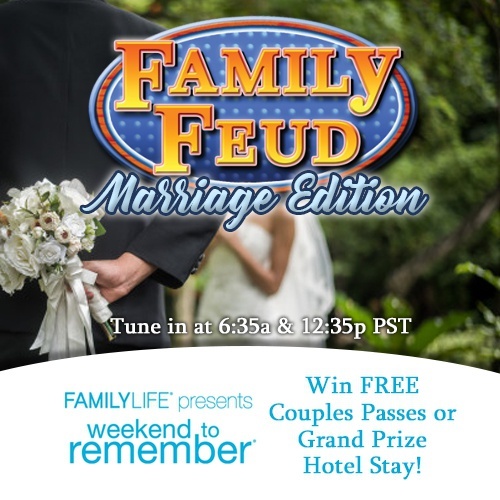 Weekend To Remember - Family Feud Marriage Edition - Right Song. Right Time. True love is worth celebrating! And all this week, leading up to Valentine's Day, we're giving you the opportunity to invest in your marriage and win a Couple's Registration good for any Weekend To Remember conference in the country! Biblically-based insights from top speakers and marriage experts. Opportunity to relax and rediscover the reasons you fell in love. Helpful tools and resources for an immediate impact on your marriage. Plus, you'll be entered in for the Grand Prize package of upgrading your Weekend To Remember experience to include FREE hotel stay in Las Vegas at The Westin Lake Las Vegas Resort & Spa, June 7th through the 9th.